The Cross Border Summit here in Shenzhen, China is about a lot of things – learning and staying on top of the latest trends in e-commerce in and out of China – but also its about making relationships. Last year we noticed a lot of people making deals and talking business, so much that we doubled down and focused hard on putting together a proper “business matchmaking” session at the end of each day in this year’s summit. No, we’re not talking about getting you a boyfriend or girlfriend (although last year we created a few of those relationships too!) – we are talking about making a business relationship. We will put together all the speakers and VIPs on that day (or those from the other day who are around too) and have them at a table in the meeting room. We’ll try to facilitate this as much as possible by having people rotate tables, numbering the tables, putting clear names and signs at each station, and having our organizing team around the matchmaking session to assist in getting attendees to the right people. The idea is simple, we don’t just want you to come to our summit, listen to some speakers and collect a pile of name cards. We want you to walk away with real business relationships that you can directly plug into your business for years to come. And of course also have the speakers sessions and the pile of name cards (ha!). How To Take Part in the Business Matchmaking Session? By attending the www.globalfromasia.com/crossbordersummit/ Cross Border Summit you will have this session included in your entry. Just keep your energy high throughout the day, as this is the last session of the daytime’s events. We will have dedicated summit team members whose job is to know who you are looking to meet at the summit. So as early as you can let our team member’s know in the event, the sooner they can check through the attendees and speakers and get that person available for you at the match making session. A new supplier in China? Factory, service provider to help you with the operations locally? A business partner – looking for something as formal as an equity partner in your e-commerce or product related business? Staff? Looking to hire, in China or outside? Customers – well who isn’t? But depending on what your offer is, we can work closely with you to get it going and find some leads. Be creative – let us know what you’re looking for, between our organizing team, speakers, and attendees, we are sure to get you something of value. If we don’t have someone at the summit, we can still assist you. Probably make an introduction in Wechat and you can get that relationship conversation started. So once the session starts, we are going to try to “rotate” as rapidly as possible. We’ll notice if one person is talking too long to another, and then we’ll ring an alert so that we get some movement happening. We notice many times at conferences some of the more “shy” people don’t get a chance to engage with a speaker or attendee. This time, we want to make sure everyone has that chance – that is a big value at the Cross Border Summit and why we have a smaller, more comfortable size of attendees. We want to get this conversation started at the matchmaking event, and then you can carry on at the evening after party sessions or the next day. So have your business card, heck, bring some brochures! Of course people can connect on Wechat or in other ways – but we want to make sure those really interested in you and your service can walk away with something – at least a name card. Have something ready to provide to a potential business partner, write down some notes, and maximize the effectiveness of this session. Engage With Our Online Summit Attendees! We will also have live streaming with our online ticket holders. We want to have our team members also help them to connect with relevant attendees and speakers, so be ready if there is a screen in your face with a bunch of people – you can answer their questions and make a virtual online relationship, right here at the Cross Border Summit! Again, don’t be shy! We’ll have our Cross Border Summit organizing team with clear CBS shirts on, approach them and ask for a hand. Let them know if you can’t find someone, or if one of the tables is being overrun with a more dominant attendee. We want to give equal chance to all attendees to engage with the speakers and other VIPs. One even more exciting thing that we are launching at this year’s summit is our market.globalfromasia.com/ GFA Market. This is a platform where the service provider (seller / person doing a service) can list what they can offer, and then you as the person paying for the service (buyer) can order the service directly on our system. This way, there is less fear of the deal going south afterwards. We hold the money while the service is being done (escrow) and release once submitted. So at the match making session, if you would like, we can help you setup your new order deal on our platform for you – right there -and for free! Just another value add bonus for Cross Border Summit speakers and attendees! This matchmaking session will happen at the end of both days events. The goal is to have you walk away with not just knowledge and name cards, but also some actionable business opportunities. The way it works, please come prepared with which speakers, sponsors, and other organizers you’d like to meet. Our organizing team will line you up with those people, and give everyone an equal opportunity to connect with and engage with relevant business contacts. To re-iterate – Cross Border Summit is about making deals. We keep the event size a bit small (if you consider 150 people small! ), or at least smaller than most conferences here in China, to allow more relationship building and deal making. In our first conference in 2016, this was one of the biggest feedback answers we got – people are able to really engage with one another, even talk to the speakers, and make relationships. We want to build that reputation of being a high quality, business event, where you come and meet quality speakers and attendees and come back to your home country with a solid list of business relationships. 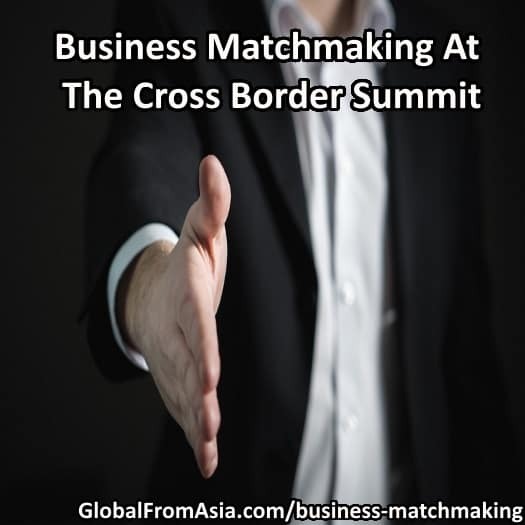 So even if it’s outside of the matchmaking session (in the morning, lunch, afternoon, even evening) – don’t be shy to ask the Cross Border Summit organizing team to help you find someone. We are all passionate to bridge China to the world, and make international business more engaging and friendly. See you at the www.globalfromasia.com/crossbordersummit/ Cross Border Summit and we look forward to you walking away with some solid deals afterwards! Feedback and suggestions on improving this matchmaking session is greatly appreciated and we take all into serious consideration.